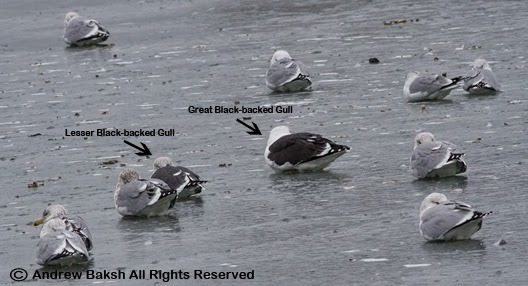 My first Lesser Black-backed Gull in Brooklyn was back in 2010. They are not common in our area and so I was especially pleased to learn of two spotted by Peter Dorosh near the shore along Coney Island Creek near the Six Diamond Ball Fields. Somehow, I have to continue trying to convince Peter and others to not only tweet and or text these sightings but to also post them to the list serve. 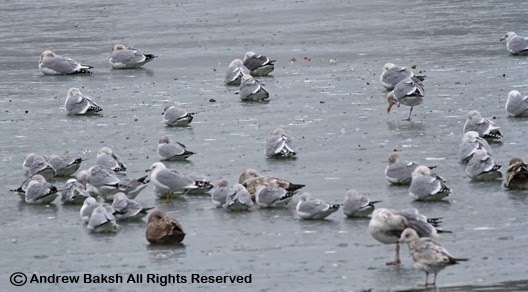 Lesser Black-backed Gulls are worthy of posting even if it is just posting to eBirdsNYC and not to NY state. Here are some photos. This is a nice comparison of a Great Black-backed Gull and Lesser Black-backed Gull in the same frame, which was obtained via phonescope (taking the photo with my iPhone and Scope using a special adapter). One of the two Lesser Black-backed Gulls. 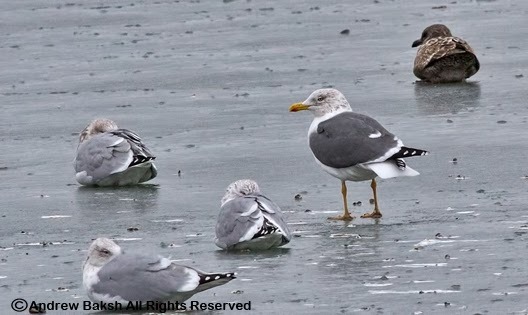 Lesser Black-backed Gull number two in a standing posture which shows its yellow legs.